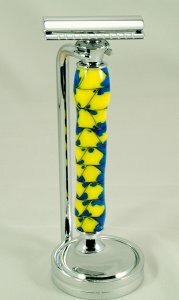 Blue/Yellow Safety Razor Handle  - $45.00 : TFW Design Studios, Handmade pens and other turned items. Blue and yellow honey comb acrylic. This safety razor handle has chrome hardware and uses a safety razor refill. Razor stand NOT included, but available separately.